The countdown has become, it’s a matter of just 13 days now before the festival of the year starts. The bright shiny sun in the blue sky with the white clouds marks the onset of autumn. And with autumn comes Durga Puja followed by Lakshmi Puja and Kali Puja. 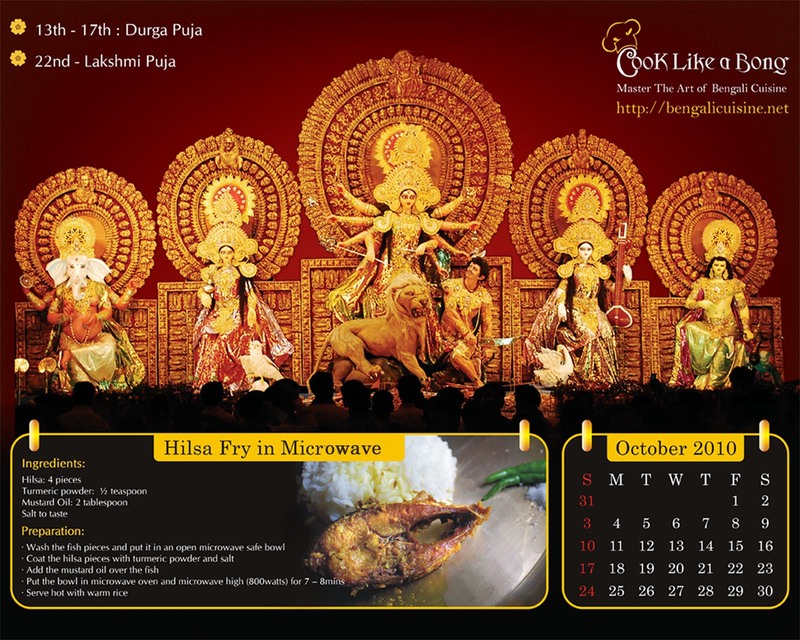 This month we at Cook Like a Bong thought of doing something new to mark the largest festival of the Bengalis. We are publishing the first monthly Calendar starting from this month. Those of who are already subscribed to the mailing list will get the Calendar delivered to their inbox. Subscribe to Cook Like a Bong and get an awesome collection of 26 authentic Bengali recipe e-book. You’ll also get a high resolution calendar delivered to your mail. You can also download the image from below and save it as your desktop calendar for October 2010. Please let us know your comments and suggestions. You can write a comment here or mail us at bengalicuisine[at]gmail[dot]com. Nothing is more refreshing then glancing through your piece after a extended day. You keep many users motivated and energized. Don’t ever end as your articles are always much awaited. Thanks guys.. dis was a much needed thing.. baire thakle we have no clue which date is what..great gotta download it !!! You are most welcome. I wanted to put this up as a post so that every body gets to know the timings and dates. I’m well aware of the fact that its near to impossible to find a Panchika outside Bengal :D.